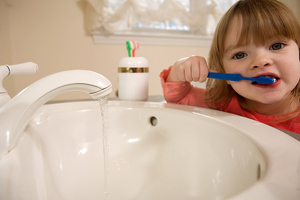 Top things that are bad for your children’s teeth. Gummy vitamins. While these vitamins may taste great, they are not great for your children’s teeth. Anything of a gummy retentive texture tends to stick to and linger in the grooves and crevices of the teeth and in between the teeth. This can promote cavities. Alternative: alternaVites Kids, www.alternavites.com, multivitamins melt in your mouth, allowing them to go down quickly and not cling to teeth. Plus, they are sweetened with xylitol, which dentists recommend. Juices and sports drinks. Most parents know to limit sodas for their children, but juices can be a poor choice, too. Most tend to be high in sugar or citric acid flavorings, which can lead to tooth decay. If you still choose to serve juices, stick to choices that state 100-percent juice on the label with no added sugars.Also serve diluted with water to cut down on sugar content— it’s economical, too. Try not to give kids more than one serving a day, which should be consumed in one sitting and preferably with a meal. Alternative: Tap water. If your tap doesn’t contain fluoride, then choose fluoridated water or a fluoride supplement. Be careful of excessive bottled water as it doesn’t contain fluoride. Snacks. As the American Dental Association states that foods eaten as part of a meal cause less harm than in-between snacks. This is because more saliva is released during a meal than during a quick snack. Excess saliva helps to wash food particles from the mouth and lessens the effects of acids on the teeth. Alternative: During snack time, stick to cheese, raw veggies, plain yogurt or a piece of fruit. Dried fruit and granola bars. These types of treats are sticky and can linger between a child’s teeth long after consumption. Same with chewy candies. Because it is harder for saliva to reach in between teeth to act as a natural neutralizer, this can lead to calcium loss and tooth damage. Alternative: Fresh fruit and apple sauce are snacks that digest quickly. If kids are craving sweets and want a special treat, go for a candy bar or chocolate treats since those aren’t sticky and don’t linger in their mouth. A smart sweet option are xylitol lollipops. No matter what, always follow with water. Brushing too soon after a meal. It’s best to wait an hour after a meal before brushing. Meals and snacks leave an acid coating on the teeth. If you brush too soon, you are just brushing your teeth with the acid, which can lead to tooth erosion. Alternative: Rinse your mouth with tap water after eating or drinking. Also, drink acidic drinks through a straw to limit the amount of direct contact the liquid has with the teeth. Dr. Mary Tierney is a well-known pediatric dentist with more than 16 years of experience in private practice. She is the founder of City Kids Dental, PC, and the co-founder of City Kids Dental North Shore, LLC.